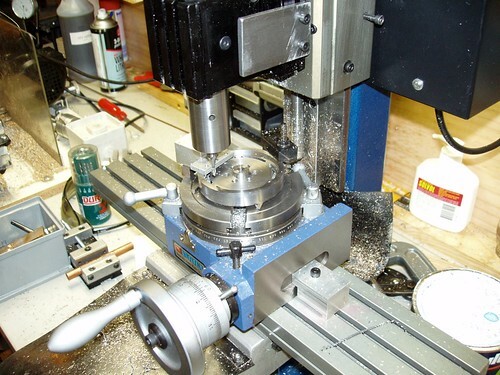 Fiddly, fiddly - Rotary table is centered under spindle and then flywheel is clamped to rotary table after itself being centered to the rotary table. First time I've done this - about 40 mins with a DTI. I need to turn a morse taper plug with a spigot for doing this sort of thing. Once everything was centered Y axis offset by the prescribed amount and the inner holes were drilled, then offset again to drill the outer holes. 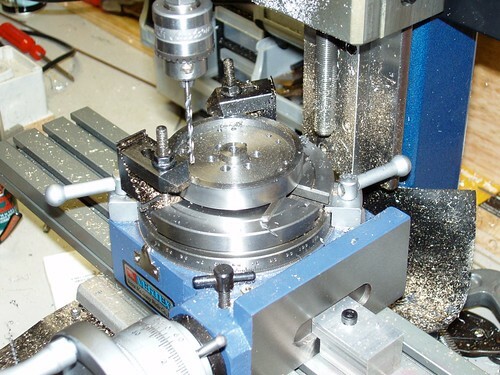 Once the holes were drilled without disturbing the setup, the relevant bits that aren't spokes are milled out. This shot shows the outer radii being slotted. The astute will see that the clamping setup has changed - I had to remove one of the step clamps because the stud was fouling the end mill holder. I was able to change one of the clamps over without disturbing the setup too much - I am not working to tenths here. Chalk up another mistake to experience - Make sure your clamping setup will not foul the tool path!